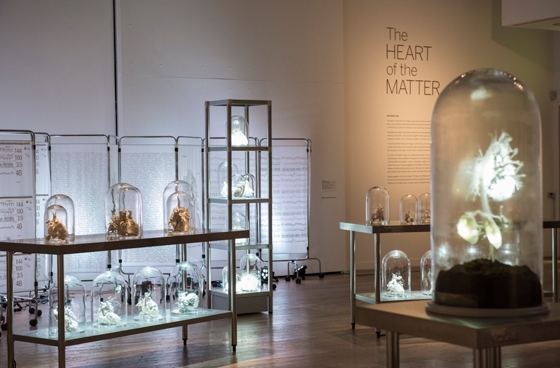 The exhibition brings together art and medicine together to reflect on the human heart. 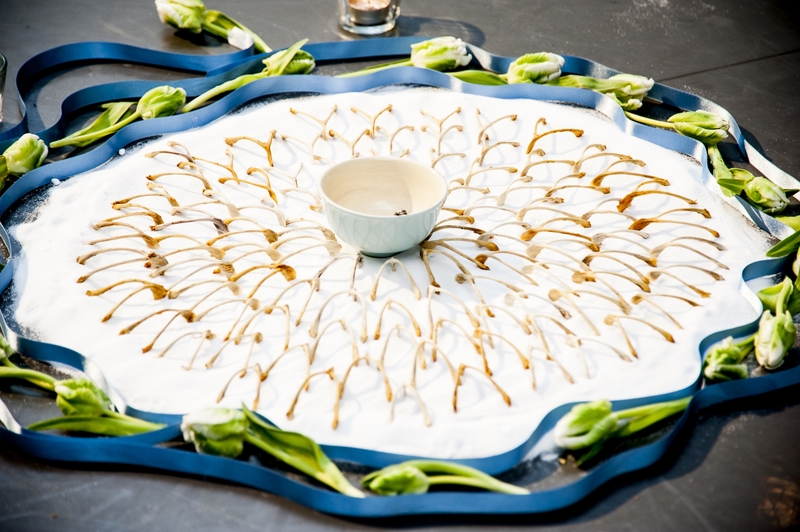 Conceived and created by artist Sofie Layton in collaboration with bioengineer Giovanni Biglino. 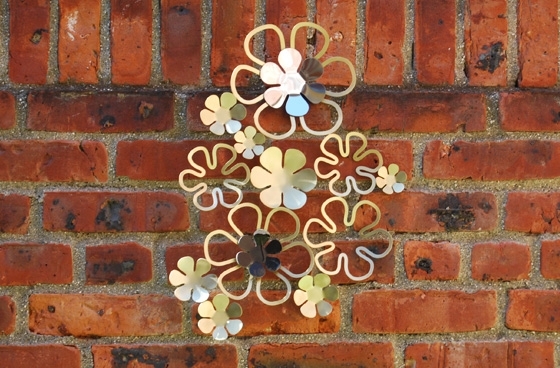 The work is inspired by patients with heart conditions, their families and clinicians. The exhibition features 3D printing, digital animation, textiles, sound and sculpture. The artworks and the stories that influenced them offer an insight into this extraordinary organ, which is both the engine room and a symbol of human emotion. An interdisciplinary exploration of the heart, its narratives and forms, with a participatory process at its core. Working with important cardiovascular centres in London, Bristol and Newcastle, the project will leading to a public exhibition tour in 2018 in these cities. In our vision, narratives/designs will be turned into a series of ‘poetic hearts’ (e.g. 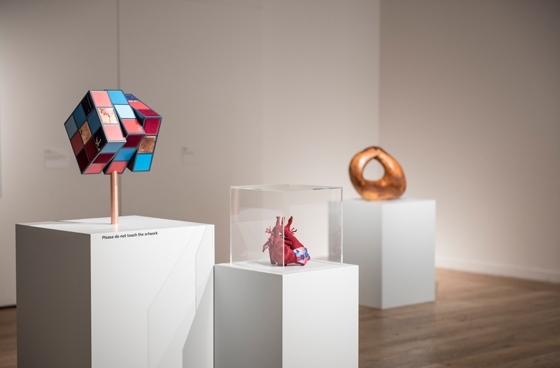 soundscapes, music composition, sculpture, textiles, digital animations...) to dialogue with the corresponding ‘medical hearts’ manufactured using 3D printing technology. The exhibition will illuminate this dialogue (between the ‘medical’ and the ‘poetic’) stimulating reflection on the uniqueness of the human heart. Produced by Great Ormond Street Hospital Go Create! and Anna Ledgard in association with Artsadmin. Supported by the Wellcome Trust and the Blavatnik Family Foundation. Under the Microscope is an arts research project conceived and led by artist Sofie Layton. The work explores how children and their families interpret medical information and understand disease, and culminates in a series of exhibitions and installations made in partnership with clinicians, researchers, patients and their families at Great Ormond Street Hospital (GOSH). Unique – Exhibition documenting artist-led participatory workshops, involving young people living with cardiac conditions and congenital heart disorders, and related artworks. Main entrance of Great Ormond Street Hospital. 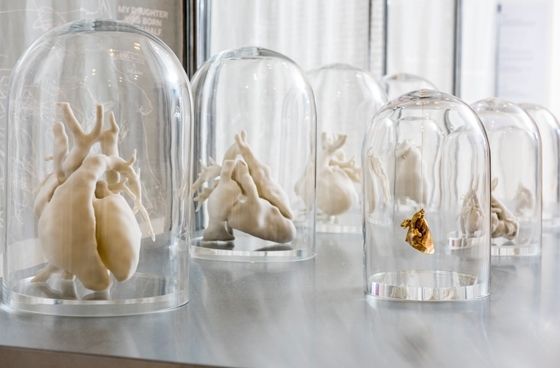 Making the Invisible Visible – A series of multidisciplinary artworks about the heart, including textile panels, 3D medical heart prints, and sculptures that translate some medical aspects of cardiology. Created in conversation with the cardiovascular imaging team, clinicians, parents and patients on Bear Cardiac Ward, young adults attending transition clinic and their parents. Institute of Child Health, Winter Garden Gallery Space. In Isolation – A sensory installation, which explores the visual landscape and intricacies of the immune system, and the experiential reality of a young patient undergoing gene therapy. The GOSH Friends’ Garden Access to exhibits is strictly through guided tours only. “Being artist in residence at GOSH for the past 12 months has been an incredible privilege, and transformative for my practice. The generosity and creativity of parents, patients, scientific and medical staff has enabled me to begin to make the invisible world of disease both visible and tangible. Medical and artistic approaches may sometimes seem worlds apart, but I’ve found an equivalence – as an artist – in the materialisation of processes like MRI scans and 3D printing, and in the embroidering and embossing the minutiae of cellular structures. Exploring this has helped me to physically mediate the complexity of illness. As an artist, I bring a haptic understanding of materiality and making, and what I feel I end up doing is holding these two conversations and acting as a lightning rod that transforms them into a series of works that explore the interface between the medical and patient worlds. A year ago, I had no idea what would emerge from the conversations or where the work would lead. Under the Microscope was created in partnership with GO Create! and the National Institute of Health Research Great Ormond Street Biomedical Research Centre. The project is kindly funded by the Wellcome Trust, National Institute of Health Research Great Ormond Street Biomedical Research Centre, Great Ormond Street Hospital Charity and the Blavatnik Family Foundation. 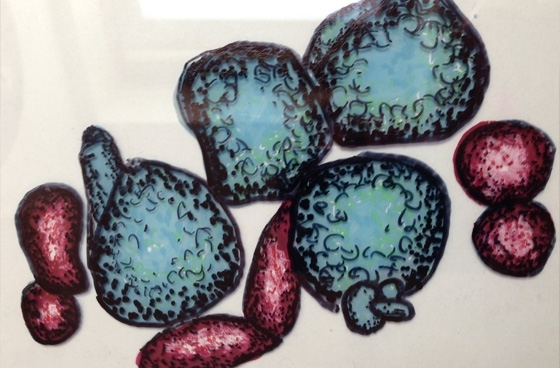 Picture: Parents' drawing of Acute Lymphoblastic Leukaemia Cells on perspex. Artist Sofie Layton has been awarded an Engaging Science Arts Grant for Under the Microscope, by the Wellcome Trust to deliver a project that researches how families interpret medical information, understand disease and decipher medical statistics. Under the Microscope is an arts research project conceived and led by artist Sofie Layton in partnership with GO Create! and the NIHR Biomedical Research Centre at Great Ormond Street Hospital and University College London. The project will investigate the work of rare disease specialists including those involved in genome science, regenerative medicine, gene therapy and innovative surgical techniques, and 3D printing. Acting as artist-mediator, Sofie will explore ways of reinterpreting these ideas creatively, to enable children and their families to engage with the world of the biomedical researcher. This research and development project will culminate in a sound and visual installation in a consulting room at GOSH, in 2016 inspired by the emotive position of being a family living "Under the Microscope". REST R&D: A sound and visual installation. Conceived and led by artist Sofie Layton in collaboration with Jenny Sealey Artistic Director of Graeae Theatre Company. Over 12 weeks working with bereaved mothers from “Slow” and mothers whose children attend Richard House Hospice. 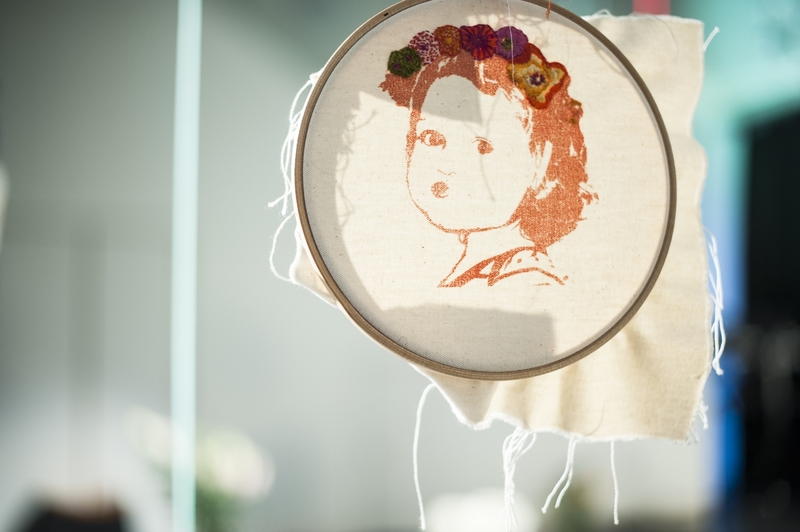 Sofie explored different creative processes, which traced, marked, recording experiences and memories of their children, which culminated in the installation at Graeae Studios. Together we drew, embossed, screen-printed, stitched and shared stories. The REST R&D was the first stage of a much larger piece of work exploring end of life and bereavement. Funded by Arts Council England and The Blavatnik Family Foundation. Experimenting with superstions - take it with a pinch of salt, make a wish! 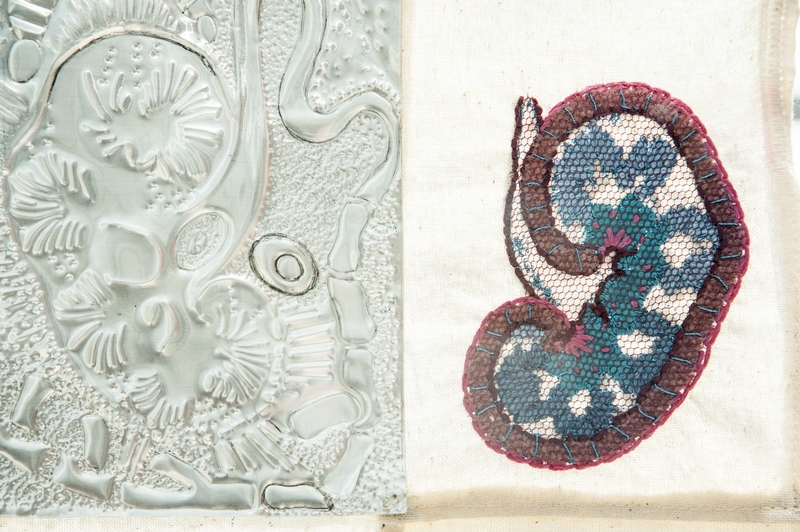 Embossed and embroidered Kidneys form workshops at Evelina children's hospital. Sofie has just returned from the US where she has completed a commision to transform an old drying yard into a reflective courtyard space. 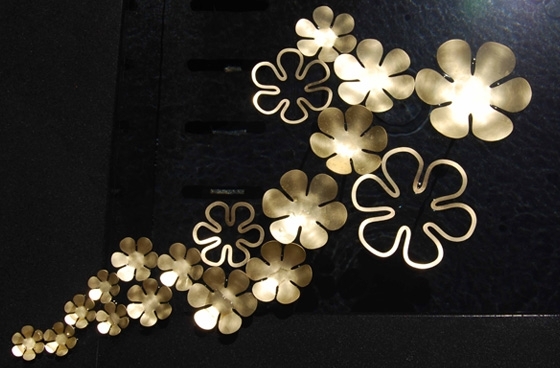 A granite fountain appears to have floating flowers on the surface created in brass with reflections and wallflower details in brass and mirrored stainless steel which adds moment and light to the sunken area. This image was taken by Andrew Whittuck during rehearsals in May 2009. 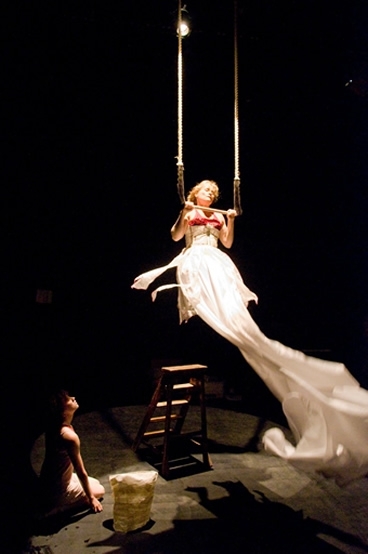 “For the Best” won the TMA award for best piece of children’s theater 2009. I created the dress based on an image and writing that a little girl who was on kidney dialysis had made whilst working with Mark Storor at Guys and St Thomas Hospital. It is the Sick Princess story and its design developed as a collaboration with Mark Storor , Cathy Wren and myself. Working in this way the boundaries between theatre, art and reality often become blured and something even more extraordinary is created.